The Lima Group (GL; Spanish and Portuguese: Grupo de Lima, French: Groupe de Lima) is a multilateral body that was established following the Lima Declaration on 8 August 2017 in the Peruvian capital of Lima, where representatives of 12 countries met in order to establish a peaceful exit to the Crisis in Venezuela. Among other issues, the now 14-country group demands the release of political prisoners, calls for free elections, offers humanitarian aid and criticizes the breakdown of democratic order in Venezuela under the Bolivarian Government of Venezuela. The Lima Declaration established outlines and goals of the Lima Group in their attempt to mediate the crisis in Venezuela. Establishes member states and outlines the democratic and noninterventional ambitions of the group to find a peaceful solution to the crisis in Venezuela. Highlights the positions and goals of the Lima Group regarding the crisis in Bolivarian Venezuela. Their condemnation of the breakdown of democratic order in Venezuela. Their decision not to recognize the National Constituent Assembly, nor the acts emanating from it, due to its illegitimate nature. Their full support and solidarity with the National Assembly, democratically elected. Legal acts that according to the Constitution require authorization from the National Assembly, will only be recognized when said Assembly has approved them. Their energetic rejection of violence and any option that involves the use of force. Their support and solidarity with the Attorney General and the members of the Public Ministry of Venezuela and demand the application of the precautionary measures issued by the Inter-American Commission on Human Rights. Their condemnation of the systematic violation of human rights and fundamental freedoms, of violence, repression and political persecution, the existence of political prisoners and the lack of free elections under independent international observation. That Venezuela does not comply with the requirements or obligations of the members of the Human Rights Council of the United Nations. Their serious concern about the humanitarian crisis facing the country and his condemnation of the government for not allowing the entry of food and medicine in support of the Venezuelan people. Their decision to continue the application of the Inter-American Democratic Charter to Venezuela. Their support for the decision of MERCOSUR to suspend Venezuela in application of the Ushuaia Protocol on Democratic Commitment. Their decision not to support any Venezuelan candidacy in regional and international mechanisms and organizations. Their call to stop the transfer of arms to Venezuela in light of articles 6 and 7 of the Arms Trade Treaty. That, taking into account the current conditions, they will request the Pro Tempore Presidency of CELAC and the European Union, the postponement of the CELAC-EU Summit scheduled for October 2017. 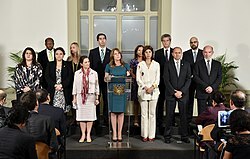 Their commitment to keep track of the situation in Venezuela, at the level of Foreign Ministers, until the full restoration of democracy in that country, and to meet no later than the next session of the General Assembly of the United Nations, an opportunity in which may be added other countries. Their willingness to urgently support, within the framework of respect for Venezuelan sovereignty, any effort of credible negotiation and good faith, which has the consensus of the parties and is aimed at peacefully achieving the restoration of democracy in the country. The Lima Group has overtly condemned the presidential elections called for by the Bolivarian government, describing them as unobserved, unjust and undemocratic. Days before the planned election date, the Lima Group – alongside the United States and the European Union – called for the cancellation of the election and prepared for responses should the election be held. Following the election which strengthened President Maduro’s position, the fourteen member nations of the Lima Group recalled their ambassadors from Venezuela. Twelve countries initially signed the declaration: Argentina, Brazil, Canada, Chile, Colombia, Costa Rica, Guatemala, Honduras, Mexico, Panama, Paraguay and Peru. Guyana and Saint Lucia joined later. The organization is supported by Barbados, the United States, Grenada, Jamaica and Uruguay, who attended the initial meeting, as well as organizations such as the Organization of American States and the European Union. In addition, the Venezuelan opposition has given their support. The Lima Group supported the sanctions Panama placed against high-level Venezuelan officials, which the Panamanian government accused of money laundering, supporting terrorism and the funding of weapons of mass destruction, and defended Panama after the Bolivarian government retaliated. ^ “Grupo de Lima | América Latina”. Deutsche Welle (in Spanish). 14 November 2017. Retrieved 15 February 2018. ^ “Declaration of Lima”. Ministry of Foreign Affairs of Peru (in Spanish). Government of Peru. Retrieved 15 February 2018. ^ “Regional neighbors call on Venezuela to cancel election”. Washington Post. 14 May 2018. ISSN 0190-8286. Retrieved 15 May 2018. ^ “Regional ‘Lima Group’ leaders urge Venezuela to suspend election”. Reuters. Retrieved 15 May 2018. ^ “Los 14 países del Grupo de Lima llaman a consultas a sus embajadores en Caracas”. La Patilla (in Spanish). Retrieved 21 May 2018. ^ “Lima Group recalls Venezuela ambassadors, condemns vote”. Deutsche Welle. 21 May 2018. Retrieved 21 May 2018. ^ “Representative of Peru in the Security Council of the UN: We have received 700,000 Venezuelan refugees and migrants due to the crisis that is the responsibility of Maduro”. Liveuamap. 26 January 2019. ^ “Perú convoca al Grupo de Lima para analizar elecciones en Venezuela”. El Nacional (in Spanish). 8 February 2018. Retrieved 15 February 2018. ^ “Cancilleres firmaron la Declaración de Lima – Caretas”. Caretas. 3 August 2017. Retrieved 15 February 2018. ^ “Grupo de Lima respalda a Panamá tras sanciones de Venezuela en su contra”. La Patilla (in Spanish). Retrieved 7 April 2018.